Mark Kermode is a film critic who expresses his opinions through many media such as his show on Radio 5 live, Friday 14:00 – 16:00, his film blog and other places such as the Observer. On Monday, 22 February, he was telling us all about it at the Watershed in Bristol where he was talking about his new book “It’s Only a Movie“. In the same cinema last summer, I saw the movie Moon which was directed by David Bowie’s son (Bowie of Space Oddity fame et al) and screened in Bristol for the last time on a day with a lunar eclipse. The universe seems to rearrange itself with all sorts of synchronicities when it comes to favourite loved things. Mark Kermode told us that it was a shame that Moon didn’t get nominated for an Oscar and he went on to describe all the reasons it hadn’t been, such as the production company not backing it and no promotion being actively pursued. It won a BAFTA and is a great movie so this little bit of information was a welcome tidbit from the great reviewer. It all felt personal. Most things he said felt intimate and as if he was interacting and not broadcasting. It was easy to get involved with his gripping tales. Some were fascinating enough on their own such as the great description of Werner Herzog being shot during an interview, accent added for our viewing pleasure, and the Helen Mirren story about calling the movie ‘The Queen’ a TV movie as opposed to one destined for the screen. The stories were interesting enough but what had me fascinated for over an hour and a half was Kermode himself. His accounts were gripping because he talked with a passion and a real determination. When he said that if you had an opinion you should be brave enough to say it to the person and put your name to it, I nodded in agreement. Whether I agreed with him or not I found myself fascinated by someone who was so direct in expressing himself. I edit and re-edit every thought at least three times and Kermode spoke harshly against qualifying things. He was funny and charming, personable and dynamic enough to stand in front of an audience for a while and keep everyone entertained. I went off to dinner quite motivated and determined from then on to express pure, unadulterated opinions and lamented the lack of recognition of Moon. The movie with Sam Rockwell acting in diverse and brilliant modes is one of my favourites from the past year and one of the few I recognised from many of Kermode’s classic and cult references. The restaurant was the lovely Flinty Red and the atmosphere was quiet and subtle until it was time to go. I put my jacket on and the twanging guitar from an acoustic grunge era started to distract me. Could that be Nirvana with a version of David Bowie’s The Man Who Sold The World? I wondered in amazement. There was no eclipse on Monday night but the universe was still there rallying around and making itself heard. Maybe I was just looking for signs but the song was quite an unexpected validation of my opinion that Kermode sold it all very well, face to face, when he talked of was and when. What else could I do, I made my way back home. 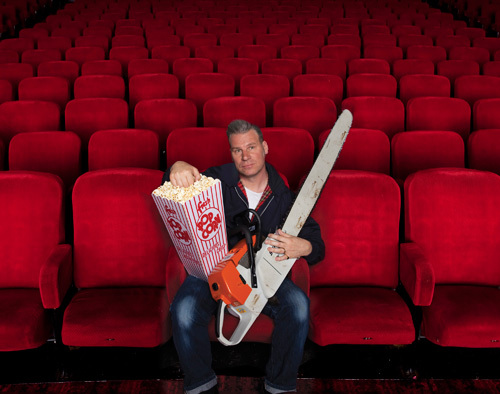 Update (27-02-10): A friend reminded me that Mark Kermode promised to come back to the Watershed and literally eat his shoe if David Lynch ever made a 3D movie. Let’s see! This entry was posted in Bristol, Movie Reviews and tagged Bristol, David Bowie, Mark Kermode, Moon, Watershed. Bookmark the permalink.